I'm a little confused about hooking up the subwoofer to my new surround system. The AV receiver (Sony STR-DN1040) has an output for the subwoofer that calls out connecting with a Monaural audio cord. The instructions for the EP125/EP175/EP350 subwoofer mention a Balanced XLR Line In and a 1/4" Phone-to-RCA-jack adapter. The picture in the instructions also show that type of connection. Problem is the subwoofer I received doesn't have that type of connection (or at least they don't call it that). There are High Level Inputs (which I know I can run from the right and left speaker channels) and then a Low Level Input. My assumption is I should use a Monaural cable from the AV to the Low Level Input. Is that correct? The Axiom subs come with a variety of ways to connect, and I think recently introduced a 1/4" option as well, not sure why. My Denon receiver has Sub Out jack which is RCA type connector that I run to line in RCA on one 350, then I daisy chain from line out RCA to Line In RCA on my 2nd sub. 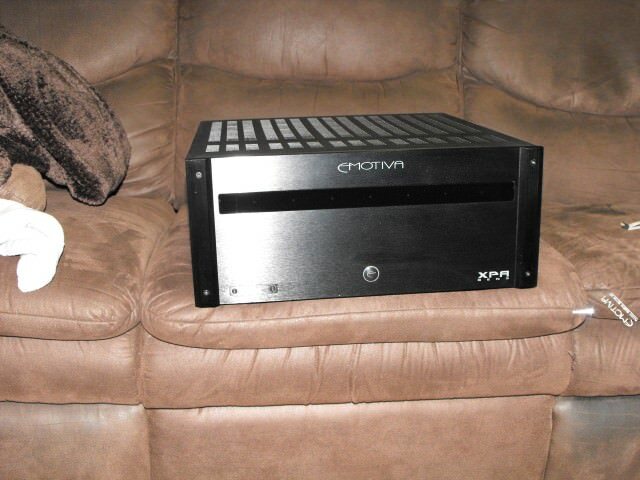 I just looked at the pics from the website, interesting I have V3 versions and my amps look nothing like those. Appears they got rid of the RCA jacks, makes no sense to me, but anyway looks like you have to use a 1/4" adapter to plug into the combo jack that says XLR/1/4" I would hope Axiom would provide you with that adapter cable. I wonder why axiom does this. It seems to me that rca low level line in is the most common/standard connection method. I do come more from a car audio point of view so I may be wrong ,though everything I have bought or built is standard rca monaural . I was sure I had read that the adapter came with the sub, double check your box. The problem is that the pics on the website and in the instructions are totally different from the subwoofer Axiom actually shipped me. On my EP350 there is no "XLR 1/4 PHONE IN" connection (or out connection for that matter). There is only a connection labeled "Low Level Input" (and Low Level Output). And of course the "High Level Input" connections. If I could figure out how to attach a picture I'd attach it. I just read your reply Socketman. It sounds like that may be exactly what Axiom has done; gotten rid of the XLR input and now just has a low level input. I'll check the socket but I'm now guessing it's an RCA monaural. go ahead and connect a rca cable from sub out to the the low level input and you will be golden. if your amp is black in color, sounds like what I have. I daisy chain my 2 350's. Receiver LFE out to linein sub1, then lineout sub1 to line in Sub2. Of course I calibrate each one of them seperately to the same dB's and then combine them. I'm going to give that a try when I get home this afternoon. We'll see how it goes.